Ground beef is one of the most versatile ingredients to cook with. 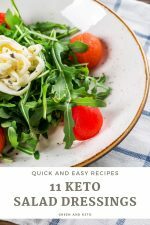 It’s a popular keto food choice because its a relatively inexpensive and quick-cooking form of beef. 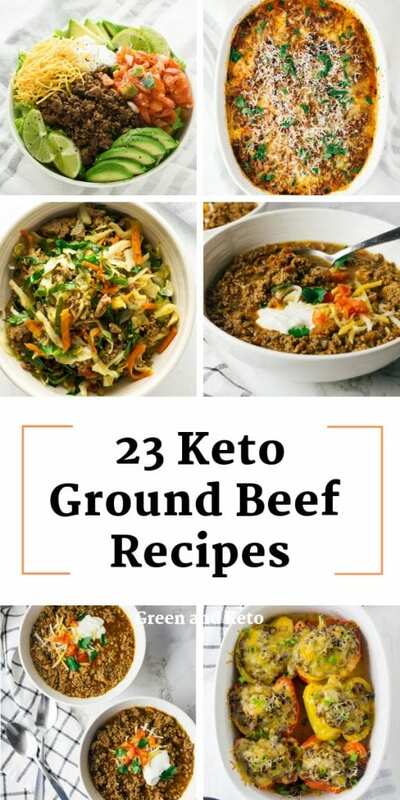 There are so many tasty keto recipes that you can make with ground beef. You can use it in many types of recipes — like meatballs, hamburgers, stuffed peppers, and meatloaf. You can also use it in lasagna, casseroles, and shepherd’s pie. If you have a pound of ground beef in the fridge, you’re already halfway to a tasty keto dish. 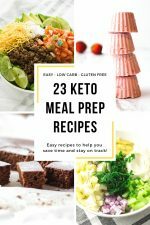 I hope you will find this list of keto ground beef recipes useful when doing your meal planning and grocery shopping! If you have a favorite ground beef recipe that isn’t on this list, please add a link in the comments! Ground beef, also known as minced beef or beef mince, is beef that has been finely chopped or ground in a meat grinder. You can buy it already ground at any grocery store, or you can grind your own at home. Beef is a great source of protein, which is essential for growth, tissue repair, energy, and proper immune function. Beef is also a great source of essential nutrients that support a healthy lifestyle — including protein, zinc, iron and B vitamins. Ground beef is usually categorized based on the cut and fat percentage. When you are shopping for ground beef, you’ll see the lean-to-fat-ratio displayed on the package. The lean-to-fat ratio refers to the makeup of the meat (and not explicitly its nutritional content). A “80/20” ratio means that the ground beef is a mixture of 80 percent lean beef to 20 percent fat, and is typically made from ground chuck. 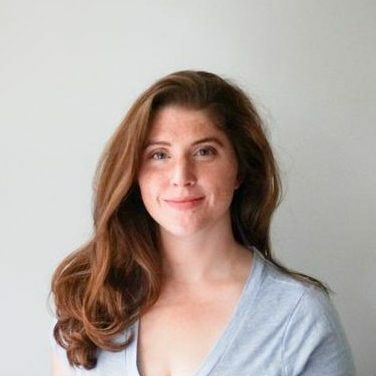 “85/15” is 85 percent lean and 15 percent fat (usually ground round) and “90/10” is 90 percent lean and 10 percent fat (usually ground sirloin). By law, ground beef can have no more than 30 percent fat. A 4 oz (113 gram) serving of 80/20 ground beef has 287 calories, 23g fat, 0g carbohydrates, and 19g protein. This Keto Cheesy Mexican Taco Skillet is packed full of southwest flavors. It’s made with ground beef, cheese, onions, peppers, and avocado. It comes together quickly, so it’s a great weeknight keto dinner! If you’re looking for a keto-friendly or paleo burger recipe, look no further. This recipe is a delicious burger patty made with beef and mushrooms, and served with dressed arugula. Find this recipe for No-Bun Hamburger at Mince Republic. 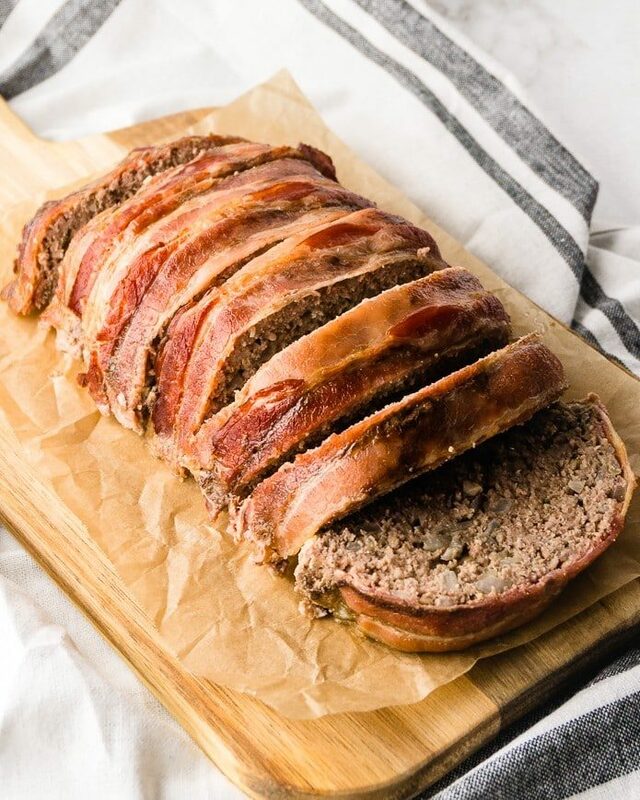 Here’s a keto meatloaf that always comes out of the oven tender, juicy, and wrapped in bacon — what could be better? This low-carb meatloaf recipe is a family favorite comfort food recipe that I’ve adapted to fit a ketogenic diet. I know you’ll love it, too. This recipe for keto meatballs is incredibly delicious and super easy. It’s quick too — so don’t be afraid of making this keto meatball recipe for a healthy weeknight dinner. For a low carb dinner, serve these mozzarella stuffed meatballs with zucchini noodles (zoodles) and your favorite keto tomato sauce. Find this recipe for Mozzarella Stuffed Meatballs at Green and Keto. Find this recipe for Keto Chili at Green and Keto. Here’s an easy, delicious keto dinner that will keep you well-fed and feeling good. 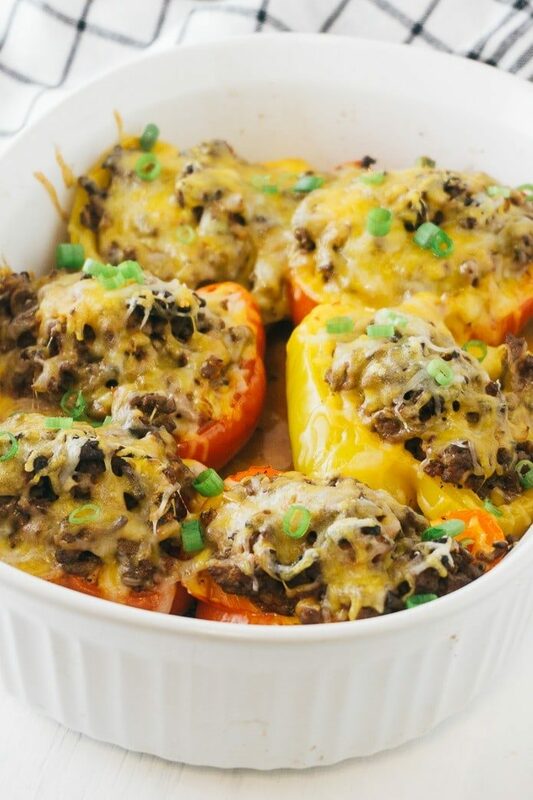 I think you and your whole family will love this keto stuffed pepper recipe. It has everything you want for dinner – meat, lots of veggies, and cheese – wrapped up in a neat little package. Find this recipe for Keto Stuffed Peppers at Green and Keto. If you’ve been cooking keto recipes for any length of time, you’ve seen all sorts of noodles made from vegetables like zucchini and eggplant. And for good reason! Keto lasagna made with zucchini noodles is easy to make and delicious! My whole family loves this recipe — we definitely don’t miss the pasta in this dish. Find this recipe for Keto Lasagna with Zucchini Noodles at Green and Keto. All the flavors of your favorite take-out egg roll, made keto. Take the meat, the veggies, and the delicious sauce. Leave the gluten and carbs. Keto Egg Roll in a Bowl, aka Crack Slaw, is made in one pan and in less than 30 minutes. This recipe is written with ground pork, but it works equally well with ground beef. 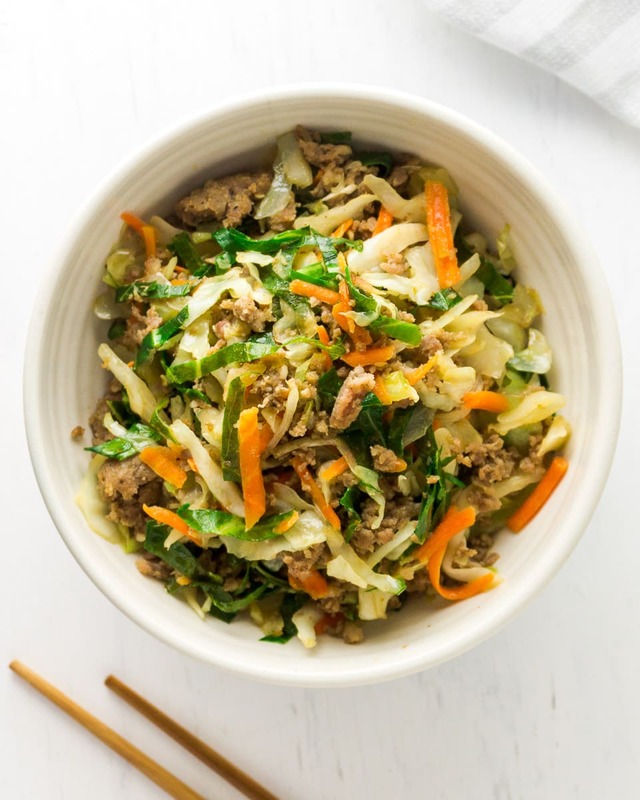 Find the recipe for Egg Roll in a Bowl at Green and Keto. Try this easy keto taco salad for a quick weeknight dinner. It’s packed with yummy low-carb ingredients like salsa, avocado, seasoned ground beef, and shredded cheese. 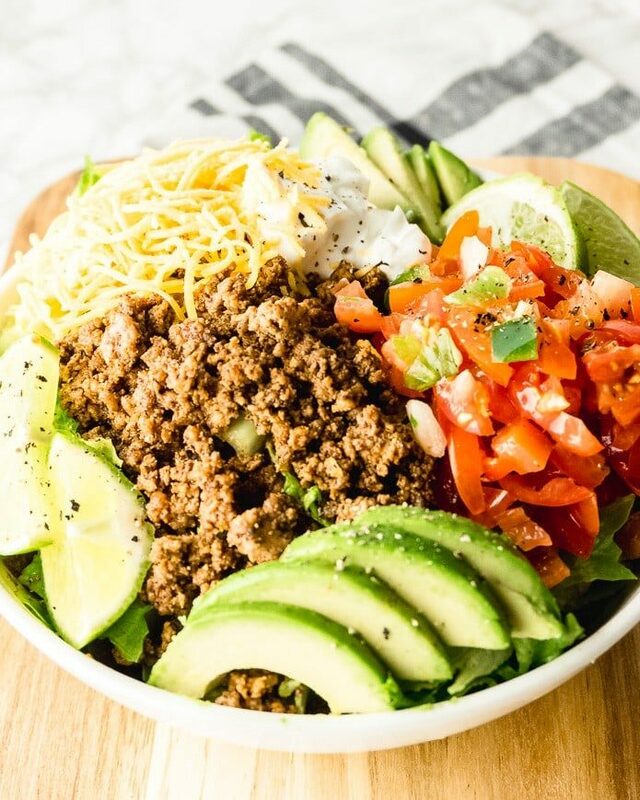 Find this recipe for Keto Taco Salad at Green and Keto. Beef stroganoff is a comfort food favorite. Swap ground beef for steak tips in this recipe for hamburger stroganoff for an even faster and easier version of this classic recipe. Find the recipe for Ground Beef Stroganoff at Low Carb Maven. Find the recipe for Cheeseburger Casserole at Low Carbe Diem. Everything you love about lasagna in a low-carb package. This recipe combines squash, tomato sauce, ricotta, and mozzarella cheese with Italian sausage to create a delicious Italian dinner. Although the recipe is written with sausage, it would work very well with ground beef, too. These keto Swedish meatballs are perfect for a party appetizer, or as a main dish served over zoodles (zucchini noodles). I think they would also taste great with keto mashed potatoes! Find the recipe for Keto Swedish Meatballs at Wicked Stuffed. These Low Carb Big Mac Bites are a yummy keto version of mini bunless burgers. They make a great low-carb party appetizer or game day snack that everyone will love! And yes, there is a recipe for the “special sauce”, too! Find the recipe for Big Mac Bites at Homemade Interest. These keto beef taquitos are pure genius! A spicy beef filling wrapped up in melted cheese “tortillas”! Serve them with a side of sour cream and garnish with chopped fresh cilantro! Find the recipe for Keto Beef Taquitos at Officially Gluten Free. Here’s a recipe for a spicy, satisfying bowl of beef ramen. This recipe uses Miracle Noodles, which are a zero carbs noodle you can find in the grocery stores refrigerated section. Find the recipe for Spicy Beef Ramen at Jam Hands. Find the recipe for Shepherd’s Pie at Green and Keto. Looking for tacos? These Keto Taco Stuffed Mini Peppers are a low-carb, bite-sized snack with all the flavors of tacos. They are made with taco seasoned ground beef and topped with optional cheese, olives, sour cream or paleo sour cream. Find the recipe for Taco Stuffed Mini Peppers at Beauty and the Foodie. Here’s a whole new way to make burgers — as bowls! Form ground beef into a bowl shape, and stuff with all of your favorite burger toppings, including cheese, mushrooms, and bacon. 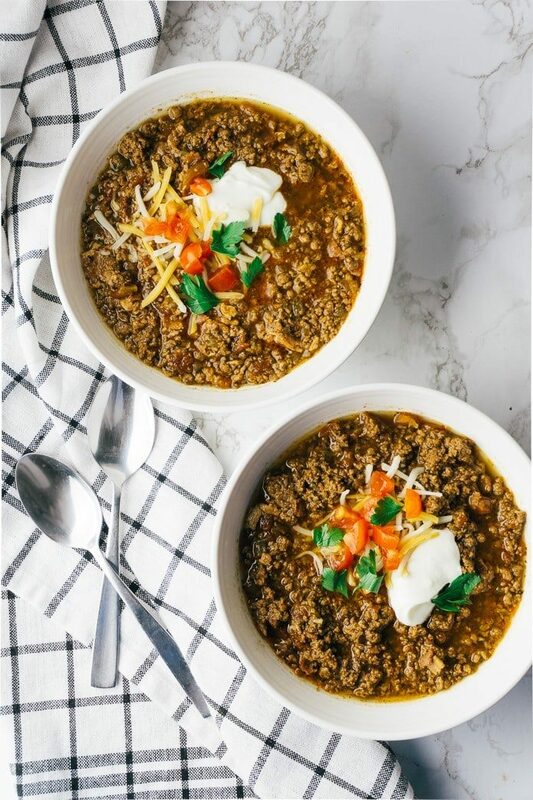 This easy slow cooker keto taco soup is perfect for fall — or any night you need an easy, comforting dinner. It’s so simple — simply brown your ground meat, throw in the rest of ingredients, and let your slow cooker do its magic! Find the Recipe for Slow Cooker Taco Soup at Hip 2 Save. These hamburger steaks with gravy are a frugal way to enjoy low-carb carb comfort food. They are so easy to make, and have only 1g carb per serving. Try them with mashed cauliflower potatoes. Find the recipe for Hamburger Steaks and Gravy at This Mom’s Menu. 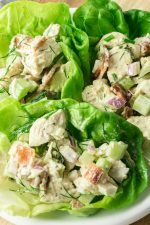 Here’s another amazing addition to your keto meal plan. These sliders are so good, you won’t even miss the bun! They’re topped with crispy fried bacon, sautéed mushrooms, and creamy melted blue cheese all served on a bed of fresh lettuce. Yum! Find the recipe for Bacon Blue Cheese Mushroom Sliders at All She Cooks. Cheeseburger Pizza combines the two family-favorite recipes – pizza and cheeseburgers! To make this recipe, top a low carb crust with a savory sauce, ground beef, onions, tomatoes, dill pickles, and lots of cheddar cheese! Find the recipe for Cheeseburger Pizza at My Montana Kitchen.